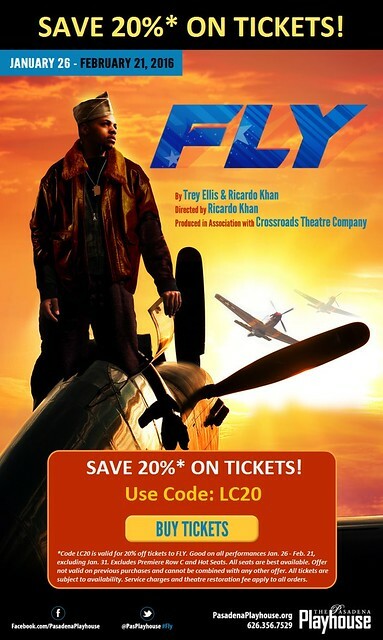 The Pasadena Playhouse (Pasadena, Calif.) is proud to present FLY, by Terri Ellis and Ricardo Khan, from January 26 through February 21, 2016. In commemoration of Black History month, LAGRANT COMMUNICATIONS and Afro-Brazilian.com are offering a 20% discount on tickets purchased with code: LC20. Directed by Ricardo Khan, produced in association with Crossroads Theatre Company and with a focus on hope, endurance, and accomplishment, FLY tells the story of the first African-American Army Air Corp fighters known as the Tuskegee Airmen, who flew over the skies of Europe and North of Africa during World War II.